Non continuous-verbs' explanation 1 , Exercises to contrast future continuous and future simple (will) 2 . Let's turn now to writing , Here you have three different links which may come in handy to improve your writing skills . 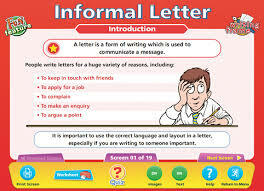 First , some guidelines to take into account when writing an informal letter. 3 . Let's finish with another informal letter sample and some exercises 5 .